I read this article and found it very interesting, thought it might be something for you. The article is called Housing For All: An Uphill Battle and is located at https://archive.indiaspend.com/special-reports/housing-for-all-an-uphill-battle-77212. Housing in India is a growing concern, not just for citizens but also for planners. Little wonder that Prime Minister Narendra Modi touched upon the subject in his very first address to the Lok Sabha after taking charge — he spoke about the need for all stakeholders to pitch in to ensure housing for all by 2022. While the population has risen throughout the country, in urban areas, driven by migration and higher fertility, the growth has been close to double the overall national rate. This has led to more people ending up homeless in urban India. Again, even as the homeless population shot up 20.5 per cent in urban areas,the figure for the country as a whole and for rural areas dropped 8.8 per cent and 28 per cent, respectively. Population growth and homelessness have pushed up slum numbers in the country from 2001 to 2011. 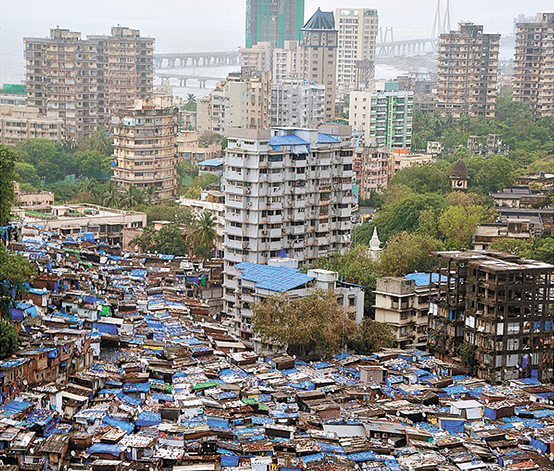 In 2011, of the total 4,041 statutory towns, 2,613 had slums — a 50 per cent surge over a decade. Simultaneously, the condition of housing in most cities — be it slum or otherwise — has deteriorated. The Ministry of Housing and Urban Poverty Alleviation (MHUPA) released a report in March 2012 on housing poverty, highlighting the poor condition of India’s overall housing stock. Housing poverty was defined as the total number of families residing in unacceptable (old and dilapidated) houses, families residing in unacceptable physical and social conditions, and families without homes. The total housing shortage in urban India, as of March 2012, is estimated at 1.87 crore, says the report. *Total Includes budget allocation for both the ministries. BSUP: Basic Services for Urban Poor was planned to ensure provision of basic infrastructure services to the urban poor at affordable rates. The duration of the mission was seven years and it was launched in 2005 under JNNURM. The mission is being carried out in 65 selected cities. The central assistance has been given in the form of additional conditional assistance (ACA). Beneficiaries contribute 12 per cent for houses while for SC/ST/BC/OBC/PH and other weaker sections, the figure is 10 per cent. More than 10 lakh housing projects have been sanctioned under BSUP, out of which 3.6 lakh have been completed — a completion rate of only 36 per cent. There are 2.2 lakh dwelling projects under development. The highest number of projects have been allotted to West Bengal (1.6 lakh), followed by Maharashtra (1.5 lakh) and Andhra Pradesh (1.4 lakh). Fund allocation for BSUP is Rs 16,356 crore, out of which central assistance is Rs 14,805 crore. ACA of Rs 22,116.28 crore has been released, out of which Rs 11, 448 crore has been utilised. The best performers in terms of project completion are Tripura (100 per cent), Haryana (87.5 per cent) and Gujarat (72.5 per cent). IHSDP: The Integrated Housing and Slum Development Programme was designed for slum improvement and rehabilitation for smaller towns/ cities under JNNURM. The central assistance, in general, is 80% while for special category states it is 90%. Beneficiaries contribute 12% for houses while for SC/ST/BC/OBC/PH and other weaker sections, the figure is 10 per cent.The best performer in terms of project completion is Daman and Diu (87.5 per cent with 14 out 16 projects completed), followed by Karnataka (84 per cent). The total fund allocated is Rs 6,828 crore. Of the Rs 4,320 crore releaswed as additional central assistance, Rs 1,225 crore has been utilised. The number of projects completed is 4.3 lakh units out of the total approved 5.7 lakh units — a completion rate of 75.6 per cent. The table below shows the number of projects completed under both schemes for the entire country. From the table it can be seen that only 4 per cent of projects were completed under BSUP and 30 per cent under IHSDP. A key reason for the weak performance of both the programmes is land acquisition, especially in cities. Another issue is the difficulty in preparing detailed project reports and identification of beneficiaries. This leads to resistance from beneficiaries during project execution. Although BSUP and IHSDP stirred some interest, they could not facilitate the granting of legal property rights to the urban poor. Property or ownership rights, most economists and social scientists agree, are important steps in empowerment and urban poverty alleviation. A new programme — Rajiv Awas Yojana (RAY) — hoped to address this issue. RAY provided credit to poor urban households to build their own home. In 2008, RAY was brought under Rajiv Rinn Yojana (RRY). The IHSDP was launched by the housing ministry on 26 December 2008. An interest subsidy of 5 per cent per annum for the entire duration of the loan (15-20 years) is provided for loans up to Rs 1 lakh for EWS/LIG beneficiaries. The scheme is being implemented through banks and housing finance companies. After a lukewarm response, ISHDP was re-launched as RRY in September 2013. The table below shows the funds unutlised by various financial organisations and government allocations for the scheme. A National Housing Bank report says an important reason why credit schemes have not worked well is the fundamental flaw in the assumption that the poor have access to land and need only financial support to build their homes. The reality is that housing in urban areas is not cheap and land is always in short supply. The report says that state-level housing boards must improve their capacity to fully utilise the available funds and deliver more houses. The Modi government had promised in its manifesto to tackle the problem of urban housing by creating ‘smart cities’. In the 2014-15 Budget, finance minister Arun Jaitley set aside Rs 7,060 crore to develop 100 smart cities. So far, master planning of three new smart cities in the Chennai-Bengaluru Industrial Corridor region, namely, Ponneri in Tamil Nadu, Krishnapatnam in Andhra Pradesh and Tumkur in Karnataka, is to be completed on a pilot basis. Most policies of the previous government focused either on building houses for the poor or offering them credit to do so. Both failed on one crucial aspect — land. Any future policy needs to focus on land acquisition as this tends to be one of the major impediments to any housing or infrastructure project. There is also the need to keep in mind who the poor are and what their housing needs are. All the stakeholders need to be part of urban planning.